Upgrade your existing manually operated garage door by fitting a remote controlled electric garage door operator; it is easy with our no nonsense web site. We sell a wide range of 'professional grade' automatic garage door openers and accessories in the UK for DIY installation as well also offering a supply and fit service. 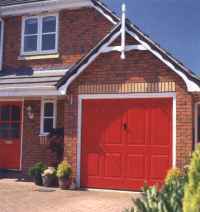 You will find information to determine what type of garage door you have, what electric door products will suit you and what price you pay. With great advice and technical support you can do-it-yourself install with confidence. We can automate virtually any type of existing ‘up and over’ garage door (retractable, sectional and canopy mechanisms) or even side hinge doors. Fitting an electric opener/motor to your door will allow remote control operation from your car. To understand what it is all about try working through the links on the right and when you are ready to make your purchase you can order online, by telephone or by post. Got an old Autoglide opener? We have a solution for you..... Maximiser Gear. Our products have been selected with quality, reliability and ease of installation in mind. These are the products that professional installers use to ensure minimal warranty call-backs, they are not inferior quality DIY units found in some UK stores. What garage door to I have? Hormann Supramatic & Promatic openers now with 2 x remote controls... top quality at amazing prices!